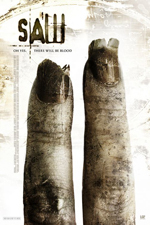 What did you think of Saw II? A Theater Version of Netflix? I was counting down the days ’til the release of Saw II since the first second I saw the trailer on TV. I absolutely loved the first movie. I thought it was well-written, well-directed, and an all-around excellent horror movie. It also had one of the best twist endings I have ever seen. So I had some pretty high expectations for the sequel, especially since it was co-written by the original writer of Saw (Leigh Whannell). I really enjoyed this movie. It was extremely well-written so that it fit in well with the original, yet was able to stand on its own. The story is so compelling mainly because of the John/Jigsaw character. How do you punish a man who is in constant pain and is dying? If you manage to save the victims, and try and convict John/Jigsaw, is sending him to prison any worse than letting him die on his own? As for the victims…Donnie Wahlberg and Erik Knudsen play a father/son pair. Wahlberg plays a police officer called in to one of Jigsaw’s crime scenes. Later, he finds out his son is trapped in a house with several other people. Jigsaw has booby-trapped the house in his usual style, and has a deadly nerve-agent flowing into the house. The occupants will die in less than two hours without an antidote. Antidotes are hidden throughout the house, within traps, of course. While the occupants turn against each other, learn more about each other, and die off one-by-one, Wahlberg is having a little chit-chat with John/Jigsaw. Wahlberg’s coworkers are viewing the events within the house on a set of televisions in Jigsaw’s warehouse. Helpless to find the victims without Jigsaw’s assistance, they are forced to have Wahlberg talk to Jigsaw and “play by the rules”. Another of the victims in the house is Amanda (Shawnee Smith) of the first movie. She explains the “game” idea of why they are stuck in this house. The victims have to figure out the things they have in common in order to get out of the house. Of course, horrible deaths follow, as does mounds of mistrust. And in the end, the movie doesn’t disappoint. Not only is there a HUGE twist ending (though not as good as the original), they leave it open for this to become a trilogy. And while generally movies that become sequels and then trilogies and then series turn crappy at some point, I’d kinda like this to become the great horror series of my generation. While the generation before had Halloween and Nightmare on Elm Street, my generation can have the Saw series (and apparently the Final Destination series as well). My final word on it: go see this movie now. Cancel your reply to this comment? © 2005 - present | All images represented here remain the property of their original owners. MovieSnobs.net claims no ownership of any promotional image, movie still, video or press shot displayed on this website!